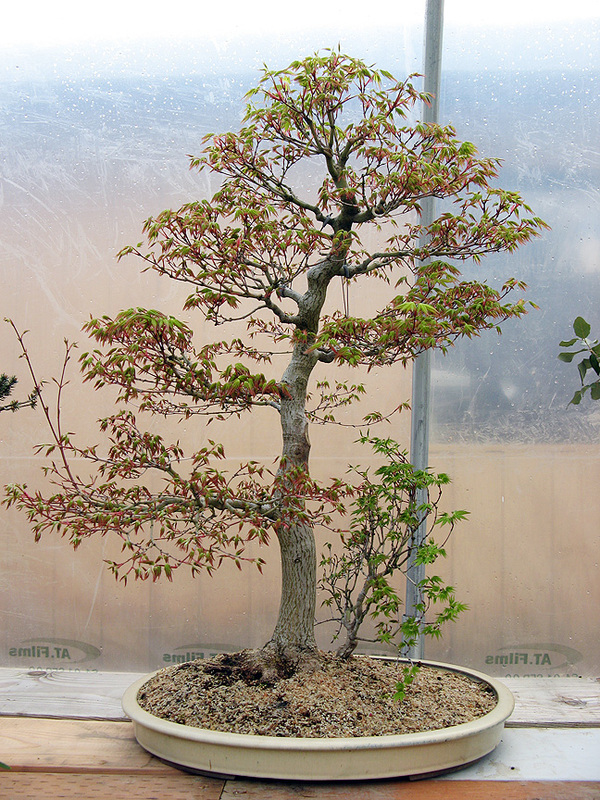 The lower right branch was airlayered off and integrated into the nebari on the right side to create, eventually, a double trunked tree. The parent tree has been tipped slighted to the right, and branches have been moved around a bit, in particular upwards. Later this year or even next year the branches of the new trunk will be wired, but for now it is best to leave it alone. The different color of leaves and timing of leaf emergence is common when you have a part of a tree with great roots, and another part—the recently airlayered part—that is on few roots. 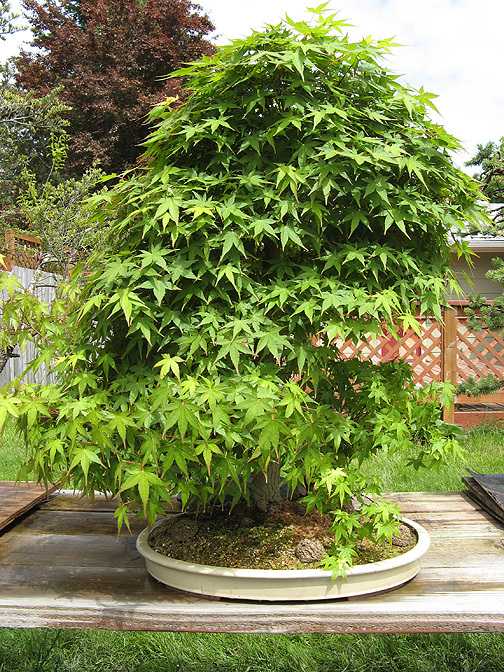 Here is the maple leafed out, in early May. It will likely need some shade protection when summer comes, to protect that new trunk. It seems like the 2nd trunk is a long ways from the main trunk and will therefore take a long time for the bases to fuse so they look like a double trunk rather than a pair of closely placed trees. Or are there covered roots from the main tree that will fuse in the next couple of years that are not apparent from the pictures? This tree has a pretty good nebari, and the second trunk was placed in a notch of the outside of the nebari. So it will fuse rather rapidly. I am not thinking in terms of 10 years but 30, and this tree will look better when it is that old than had I placed the second trunk next to the big one.